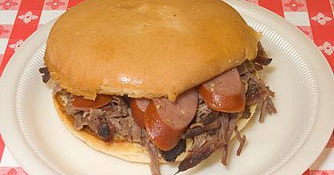 No matter what the occassion, Hog Wild has a menu option that will satisfy your needs. Your guests will love Hog Wild's delicious smoked meats and tasty side dishes. And you will love that Hog Wild is affordable and reliable. 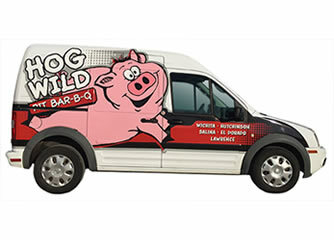 When you choose Hog Wild for your catered event - we'll put your mind at ease. Call us today! All menus are designed to be set up buffet-style and include plates, forks, spoons, napkins, serving utensils and use of any necessary catering equipment. If you don't see what you're looking for, we'll gladly customize a menu to fit your occasion or group! Bun, 5 oz. of meat and 10 oz. of sides per person. Dinner size portions of our meats and sides, served with rolls and butter. Ribs add $1.50 per person. Bun, 6 oz. of meat and 10 oz. of sides per person. Bun, 4 oz. of meat and 8 oz. of sides per person. Butter, sour cream, chives, bacon bits, cheese and your choice of 3 oz. meat. Add an additional oz. for 99¢ per person. Up to 3 choices. Ribs available on BBQ Feast only. Picked Up: We will package your meats and sides in foil serving pans. It's convenient and nothing needs to be returned. Delivered: Delivery price includes setup. Served: We deliver, set up and monitor a buffet line, or serve your guests (minimum of 50) if you choose. Also includes clean-up of service area. Extended service time is extra.